Russian North is a traditional generalized name for Northern regions of the European part of Russia including Murmansk Region (Kola peninsula), the Republic of Karelia, Arkhangelsk Region and Vologda Region. The territory of Russian North is mostly covered with taiga. Northern parts of Murmansk and Arkhangelsk Regions are occupied with tundra. Water covers a significant part of the surface. Numerous rivers, lakes and coast shores of the Beloye (White) and Barents Seas, belonging to the Arctic Ocean, whimsically interweave with land and make magnificent scenery. White Nights in summer and Northern Lights in winter impart peculiar charm to this Northern area. Special feature of Russian North is a significant quantity of memorials of Russian history and architecture, which are integrally entered in natural landscapes. A lot of age-old wooden secular and cult constructions are scattered in all region. 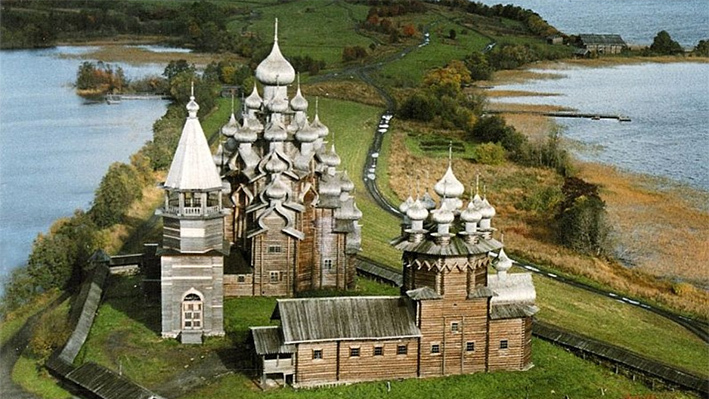 A part of them is removed to museums of wooden architecture - Kizhi Pogost in Karelia and Malye Korely near Arkhangelsk. Kizhi is located on one of many islands in Lake Onega, in Karelia. Two 18th-century wooden churches and an octagonal bell tower, also in wood and built in 1862, can be seen there. These unusual constructions, in which carpenters created a bold visionary architecture, perpetuate an ancient model of parish space and are in harmony with the surrounding landscape. The Kizhi Pogost is included into the UNESCO World Heritage List. Solovetsky Archipelago (Solovky) comprises six islands in the western part of the White Sea with distinguished nature and with the ancient Solovetsky Monastery, founded in 1429. The Solovetsky Monastery was the center of ecclesiastical, economic and political power in this part of the Russian North. The cultural and historic ensemble of the Solovetsky Isles is included into the UNESCO World Heritage List. Day 1 Arrival in St.Petersburg. Transfer to the hotel “Azimut 3*+*. Accommodation. Day 2 Day free in St.Petersburg. On request (extra charge): full day city tour of St.Petersburg: Nevsky Prospect, Neva's embankments, Rostral Columns, buildings of Hermitage museum, Senat Square, St.Isaac Cathedral, Nicolai I statue, Peter the Great statue (“Bronze Horseman”), Summer Garden, the Field of Mars, Ressuraction Cathedral of the Spilt Blood, Square of Arts, Palace Square with Alexander Column. Visiting of Hermitage Museum. Day 3 Check-out. Excursion to Peterhoff with visiting Grand Palace (with entrance) and Lower Park. Return to the city train station. Evening free. Departure for Petrozavodsk (departure between 8 p.m. and 10 p.m). Overnight in train. Day 4 06:50 — arrival in Petrozavodsk, the capital of Karilia region. Transfer to the hotel Severnaya 3*. Accommodation and breakfast. City tour. 11:15 - transfer to the pier and landing on the motor boat. Departure for Kizhi Island. Sightseeing tour with visiting church of Kizhi ensemble and ethnographic village museum. Kizhi — one and the first open-air museums and one of the most popular tourist attractions in Russia. An ensemble of wooden churches, World Heritage Site, listed by UNESCO. Packed lunch. 15:30 — departure for Petrozavodsk. Transfer to the hotel. Day 5 06:30 transfer to Sortavala. Packed breakfast. 10:45 — arrival to Sortavala. Departure for Valaam Island by motor boat (about 1 hour). Valaam sightseeing tour including Central Manor Monastery, Holy-Transfiguration Valaam Monastery, Assumption Church, Intercession, the Annunciation, Znamenskaya, All Sorrowful chapels. Tour of the New Jerusalem. Chorus of church music. Lunch in the refectory of the convent. Departure for Sortavala. Visiting Museum of Wooden Carving. Dinner in a local cafe. Departure for Petrozavodsk. Arrival on a train station about 00:00. Departure for Kem by train #22 at 00:53. Overnight in train. Day 6 09:00 — Arrival in Kem. Trabsfer on the pier. 10:00 — Departure to the Solovetsky Islands by the ship "Blizzard". 12:30 – Arrivial at Solovki Islands. Accommodation in hotel Priyut 3*. Lunch. Sightseeing tour “The History and Architecture of Solovki”. Visiting the existing temples, monuments, included in UNESCO World Heritage List: The Holy Gates, a refectory, a gallery of the central complex, the Savior Transfiguration Cathedral, Church of the Annunciation, the gallery battle of the fortress wall, spinning tower, tower of Arkhangelsk. Day 7 Breakfast at the hotel. Tour "The lakes and channels Solovki”. Boat trip in a small circle of the lake-channel system. During the tour you will learn about hydraulic monuments and structures Great Solovetsky Islands pass by boats on man-made canals connecting the 5 lakes. The distance that you have to overcome on the boats is 5 km. Picnic lunch. Excursion to the Mount Sekirnaya. Visit Holy Ascension Skete. You can visit one of the highest points in Greater Solovetsky Island - Mount Sekirnaya, from the top of which offers an unforgettable view of the northern part of the Greater Solovetsky Islands and the White Sea. You will learn the history and monuments of the Holy Ascension Skete, where during the Solovetsky camp was a punishment cell - a place of detention and punishment of prisoners, you will see a unique church-lighthouse. Return to the hotel. Day 8 Breakfast at the hotel. Check-out from the hotel. Baggage can be left in the luggage room of the hotel. Tour “Sightseeing of Bolshoy Zayatsky Islands”. Boat trip to the Bolshoy Zayatsky Island. You can visit the largest pagan temple, see stone labyrinth, a complex religious and funerary buildings, the first in Russia stone harbor, monuments Andrew's Skete. 13:00 – Return to the Great Solovetsky Island. Lunch in the restaurant "Solovki hotel”. Afternoon free. Day 9 Breakfast at the hotel. Transfer to the airport. Departure from Solovki via Arkhangelsk to Moscow. Arrival to Moscow. Connect to your international flight. DBL accommodation in mentioned hotels (2-3* in small towns, 3-4* in Saint-Petersburg), breakfasts (+ lunch or dinner as per programme), guide services during the whole trip (local english-speaking guides), transport services (private car, boat tickets, train tickets — 1 bearh in 4-bearth cabin = 2 class soft sleeper), entrance fees, Russian visa support and registration. All the flights, alcoholic drinks, visa fee. Optional tour (St.Petersburg city tour + Hermitage musuem): 26000 roubles per group of 2 people. The sequence of the excursions can be changed.